This is my new favorite taco filling. I absolutely loved these tacos. I especially loved that this cooked all day in the slow cooker. The combination of the Ranch and taco flavors was so good. It reminded me of Cool Ranch Doritos - one of my favorite foods! 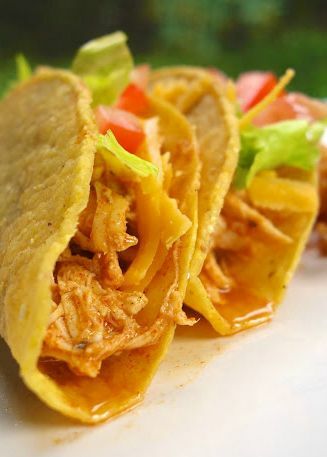 I served this chicken in taco shells, but you could use tortillas, tostadas or serve it over salad. I ate this for dinner and had the leftovers for lunch a couple of days. The leftovers were just as good as the first time I served it. I can't stop thinking about this chicken. It is seriously delicious! I am already planning on making it again ASAP. Place chicken in slow cooker. Sprinkle with taco seasoning and Ranch dressing mix. Pour chicken broth into slow cooker. Cover and cook on low 6-8 hours. 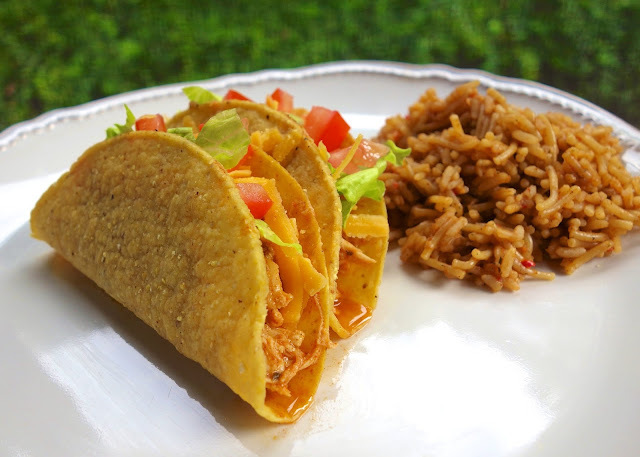 Serve with taco shells, tortillas, tostadas and favorite taco toppings. Tacos are a favorite around these parts too! Can't wait to serve the family your version, they will love it! You can use either. Enjoy! I have a 4 kg box of boneless chicken breasts to use so these are on the menu! These look great and easy! What is the measurements of the seasoning? I don't use packets so I don't know how to convert. I believe they were both 1 oz packets. To Chris: If you have to large plastic containers of ranch dressing, on the side it tells how many Tablespoons equal a packet. This sounds great! 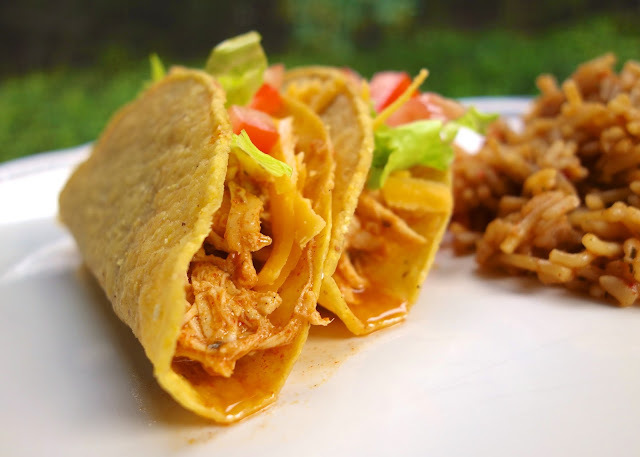 I love slow cooker recipes, and when you add the word "taco" to the mix I love it even more! Looks great! Made this for last night's dinner, increased it to match the package of chicken I had out, and I now have enough chicken for 2 more meals! Into the freezer goes one, and the other will be another night, it was a BIG hit! So simple, but delicious! Trying to decide if I could concoct a soup from one of the packages...thank you!! Should I shorten the cooking time for 2lbs of chicken TENDERS ( fresh NOT frozen) or just stick with the 6 hours on low? Thank You! You probably want to cut down the time with tenders. I would do no more than 4 hours. Was very good! Thank you for the recipe. I did 2 lbs boneless chicken breasts and boneless thighs and it was done at about 3.5 hrs on high...moist and fell apart. Thank you! This is amazing! My husband raved. My kids don't handle tacos well, usually a big mess. So I made it a casserole. I added some black beans and diced tomatoes to the chicken mixture. Then I layered tortilla chips, chicken, and cheese X3. So so good. Delicious!!!! My husband couldn't stop raving about how good the chicken was. Thanks!